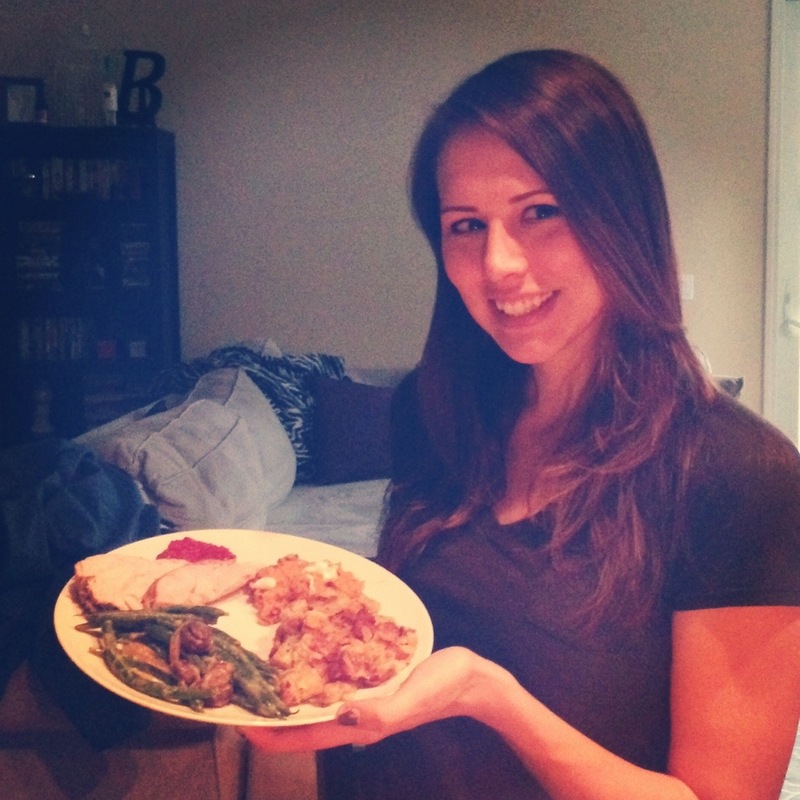 As you already know, I was pretty nervous about cooking my first big meal. So when I pulled something incredibly intelligent like slice my left ring finger open while trying to cut a bagel with a brand new extremely sharp steak knife the night before Thanksgiving, I not only worried about the outcome of the meal, but now about the safety of everyone in a 1-mile radius as well. I thought I needed stitches, but decided to let Bill quell my anxiety for once in my life. I cried for a while, put pressure on it with a paper towel until it finally stopped bleeding, let Billy doctored me up, and then moped for a decidedly finite period of time, absolutely sure my efforts the next day would be futile. I was done for. The turkey had already won, and it was strictly my doing. Not a great start. In the morning, however, it was ON. I was determined to throw down. And despite the misstep the night before, here is how THAT turned out. You GUYS. I did that. I don’t have the faintest idea how it happened, but it was awesome. Getting started was tough since I get easily overwhelmed by too many things going on at once and couldn’t quite figure out where to begin. So I started by making breakfast, sitting down with a magazine, and taking a deep metaphorical breath. I highly recommend this first step to everyone. Take notes. After that, things went smoothly for the most part. Well, besides not having any idea how to stick my hand in a turkey to pull out the neck and giblets. Or loosen the skin from the flesh. Or tuck the wings under. You know. There was only one moment that I started to panic, thinking I bit off more than I could chew, and that, of course, was during the hour before dinner is served – that magic chaos period my mom has always talked about as if it were a swarm of locusts descending over both the kitchen and whoever pulled the short straw when deciding who was cooking dinner. But my friends, thank goodness for Bill. 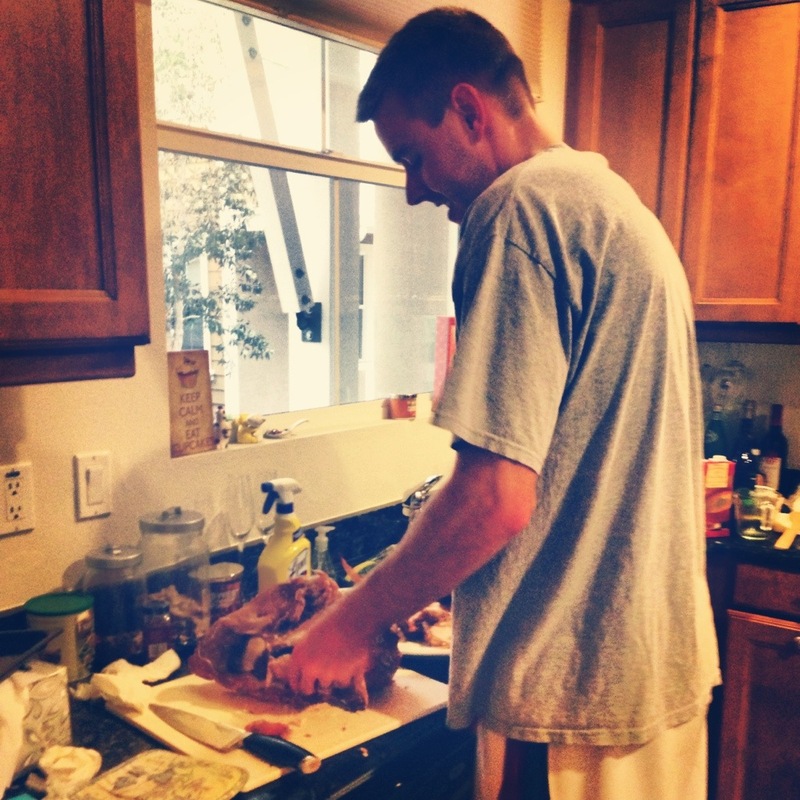 He has proven me wrong yet again, this time by being the best sous chef a lady could ask for. 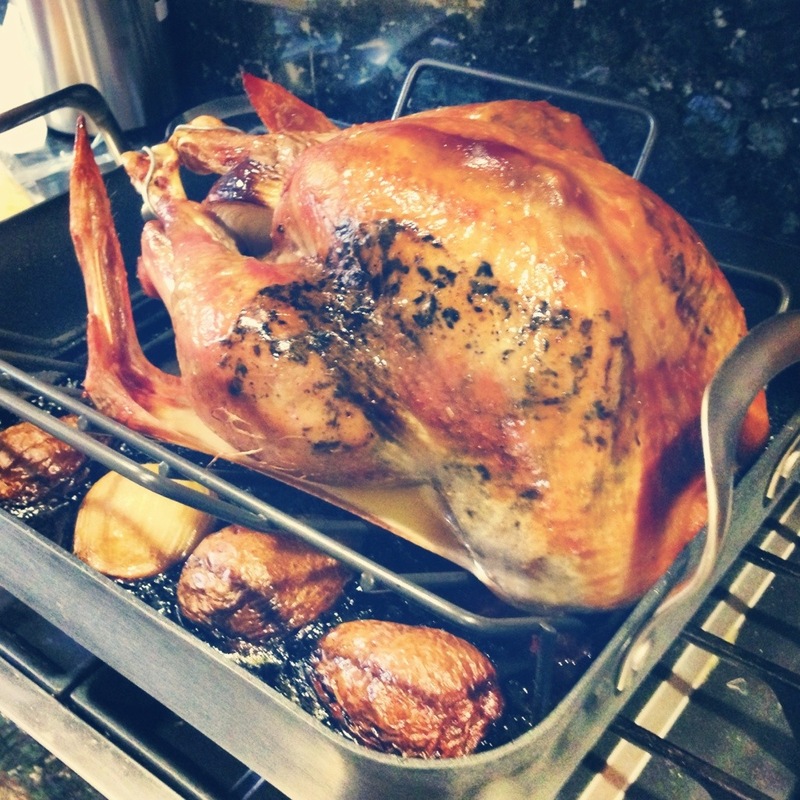 And for the second time in less than 24 hours, he managed to calm the wife-beast just as things started to spiral out of anxiety-ridden control – all while trimming the green beans, pureeing the gravy, and carving that god-forsaken bird. 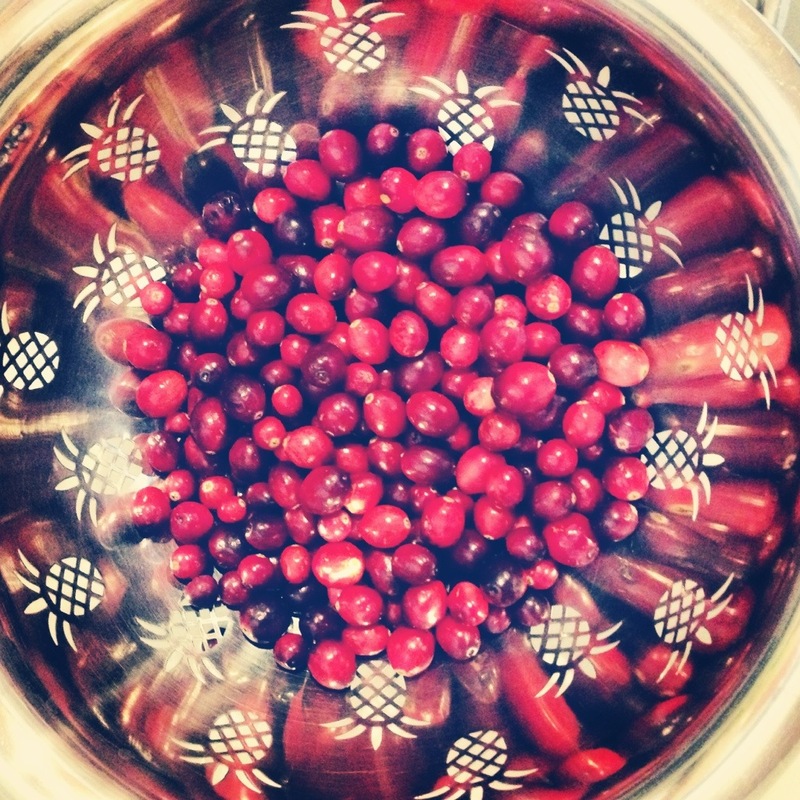 Those are fresh cranberries. I mean, really fresh. Like, so fresh I they needed to be rinsed and drained and smashed and blended. 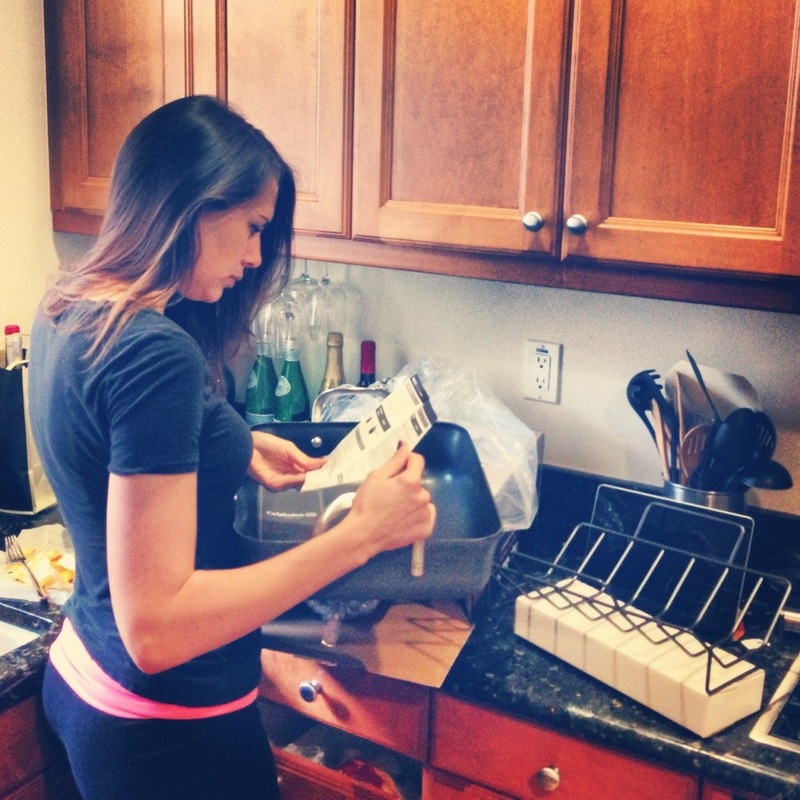 It took me a few minutes to figure out the pan… Yeah, just the pan. 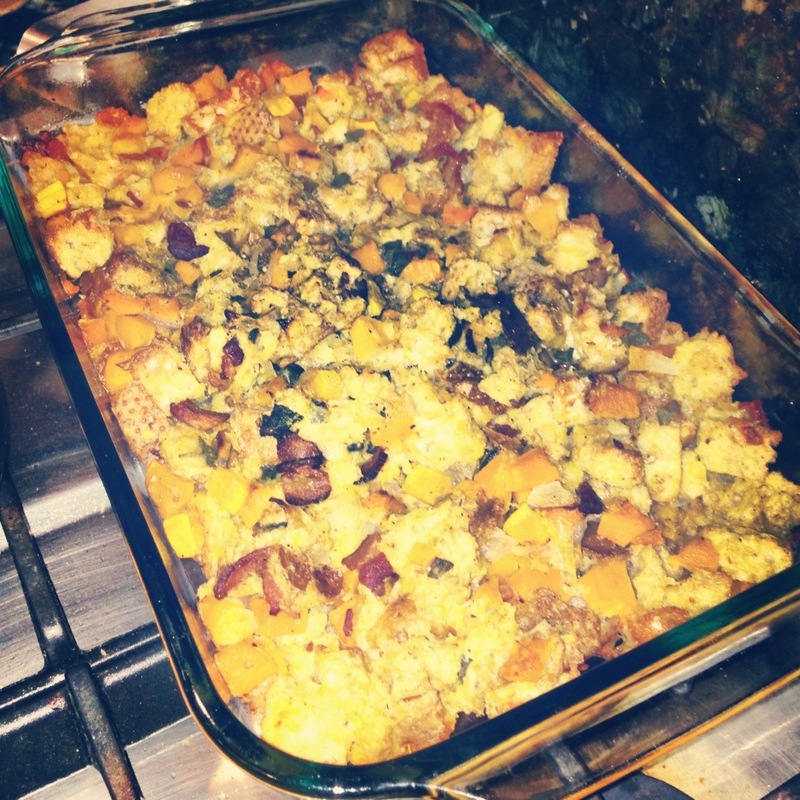 Butternut-Bacon Stuffing from Cooking Light: Delish, especially as leftovers reheated in the toaster oven! 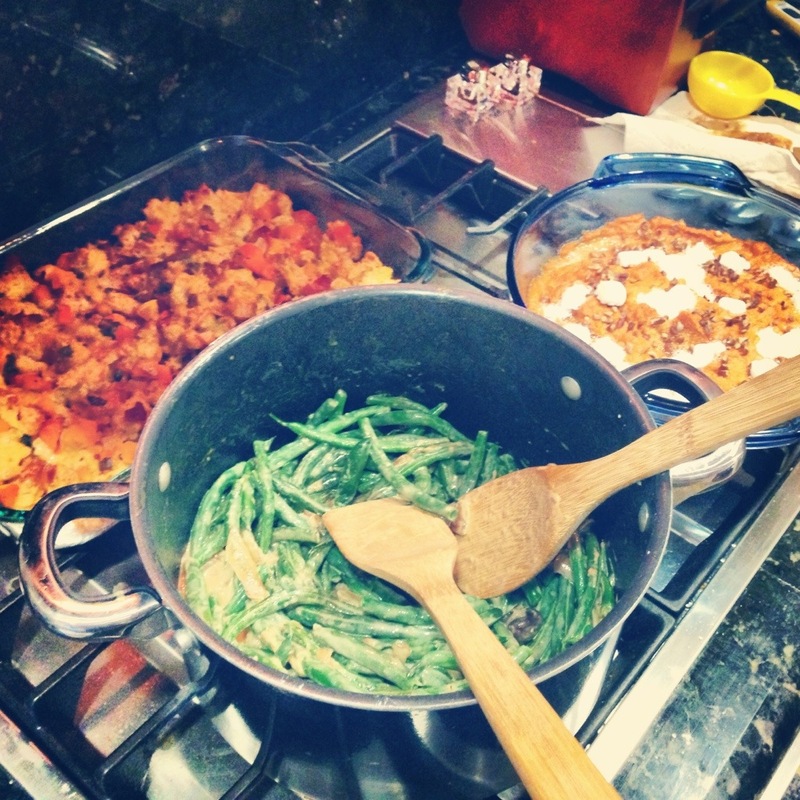 Green Beans with Sherried Mushroom Sauce from Cooking Light… We cheated and put the fried onions on top anyway. Don’t tell my arteries. 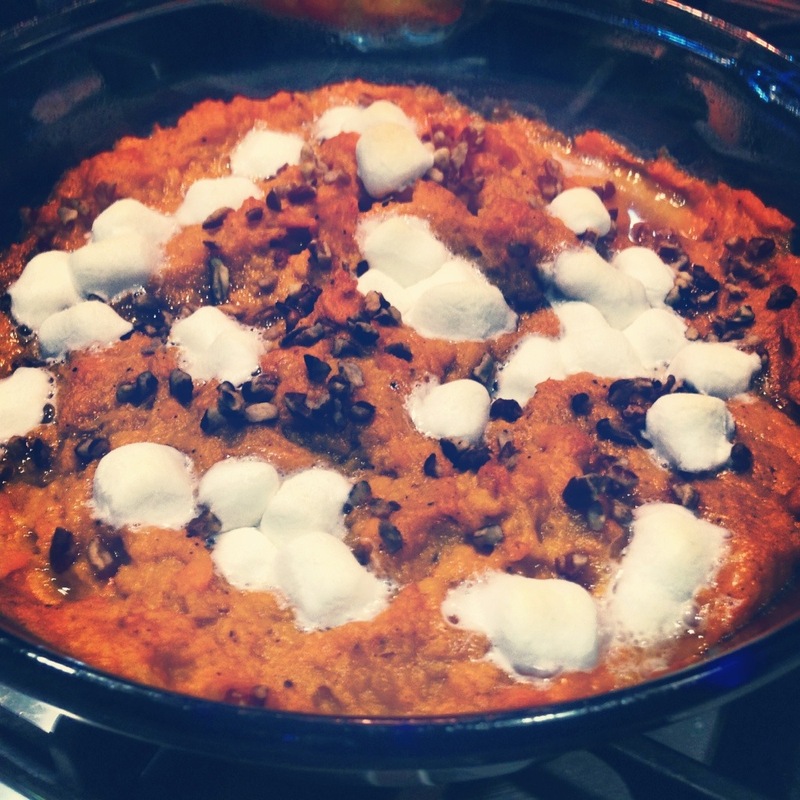 Maple-Pecan Sweet Potatoes from, you guessed it, Cooking Light! Made with real maple syrup and vanilla, these puppies are GOOD. Bill’s self-declared favorite. A relatively clean production area, obviously post-chaos hour. 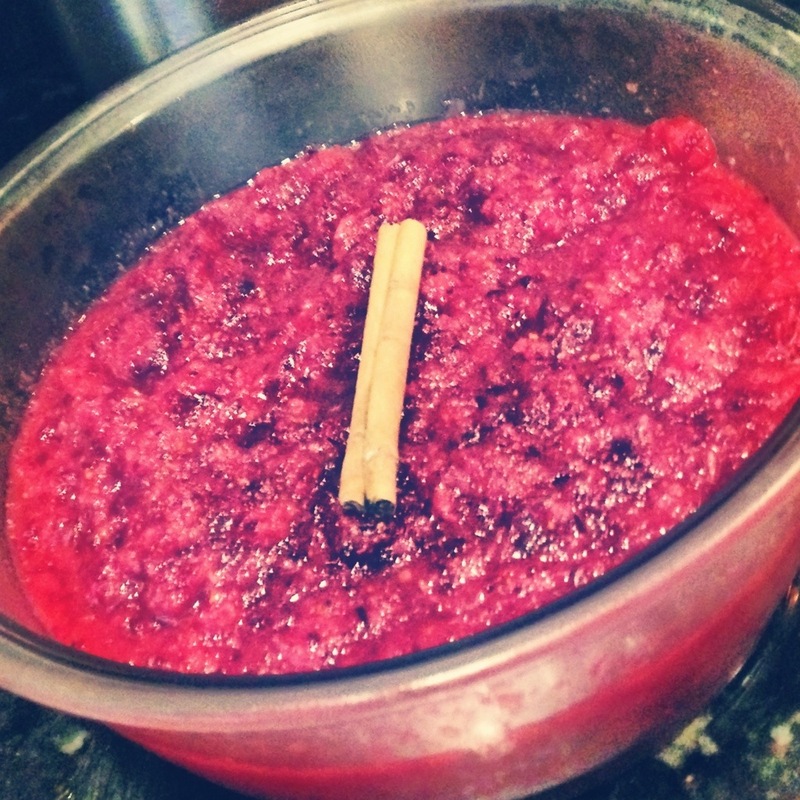 And homemade – 100% from scratch – Cranberry-Orange Relish. This was surprisingly easy, but for some reason telling everyone you made your cranberries from scratch is really impressive. Probably because they are so easy to buy at the market would be my guess! Anyway, this is an awesome recipe. It includes a whole orange and the zest of an orange rind, so the tangy citrus kick gives it a little something extra. It’s so great to eat straight out of the fridge as well, and it feels like a grown-up version of applesauce. Which is, obviously, rad. And here it is… the finished product! 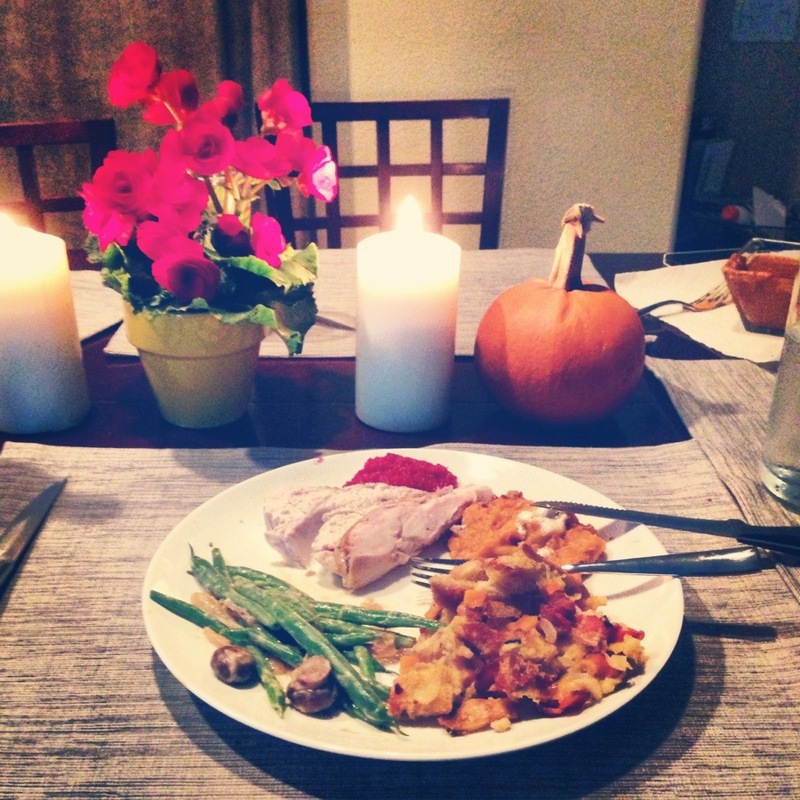 (In true do(hot mess)tication, notice the one little drip of sweet potatoes chilling on the edge of the plate. Polished presentations are for cowards. Happy husband with turkey hands! Okay, so I’m PROUD. I’ve never felt like a chef before, and until Thanksgiving, I never felt like cooking would be something I would ever be good at. There’s hope, everyone! There is HOPE. One more presentation pic for good measure. So this is how I celebrated. 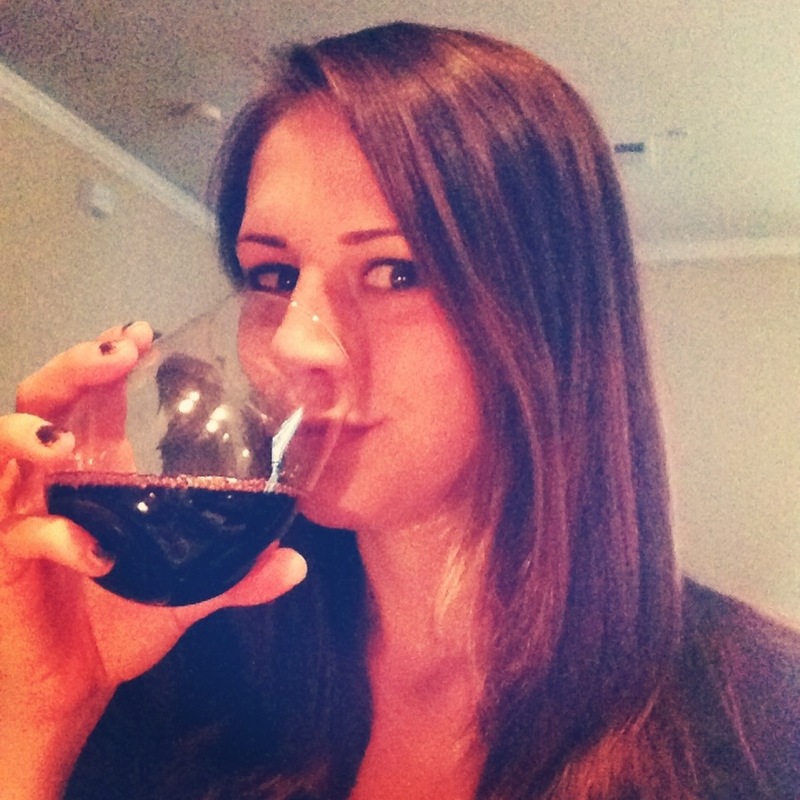 A much, MUCH deserved glass of wine. All in all, I feel like the day was successful, and the biggest success was probably that despite the difficult decision to be away from my family of origin for the first time on such an important day, there were many more “best parts” than I expected. Bill and I had our first major holiday together. 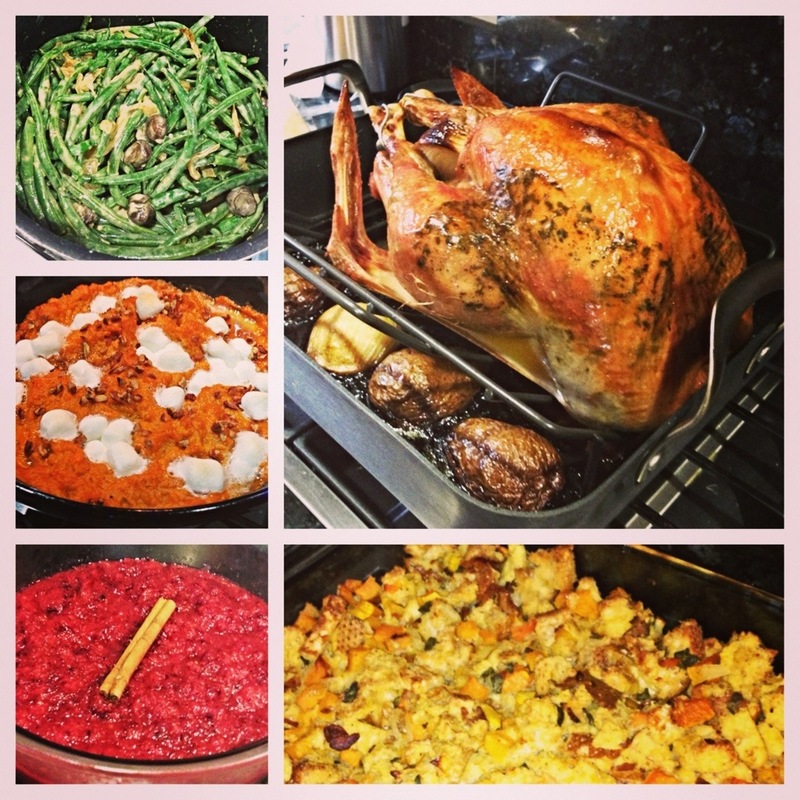 We got to take on the challenge in the kitchen and conquer that turkey. We proved that we are a great team, even when we have no idea what we are doing. We sat down in our sweats, fully intending to change into nice clothes and do our hair but deciding we were just too exhausted, and we ate a huge meal, just the two of us, and it was AMAZING. And lastly, I thoroughly passed out on the couch, fat and very happy, at around 7:30 p.m. in the middle of one of my favorite shows like an old grandma. It was SO worth it. 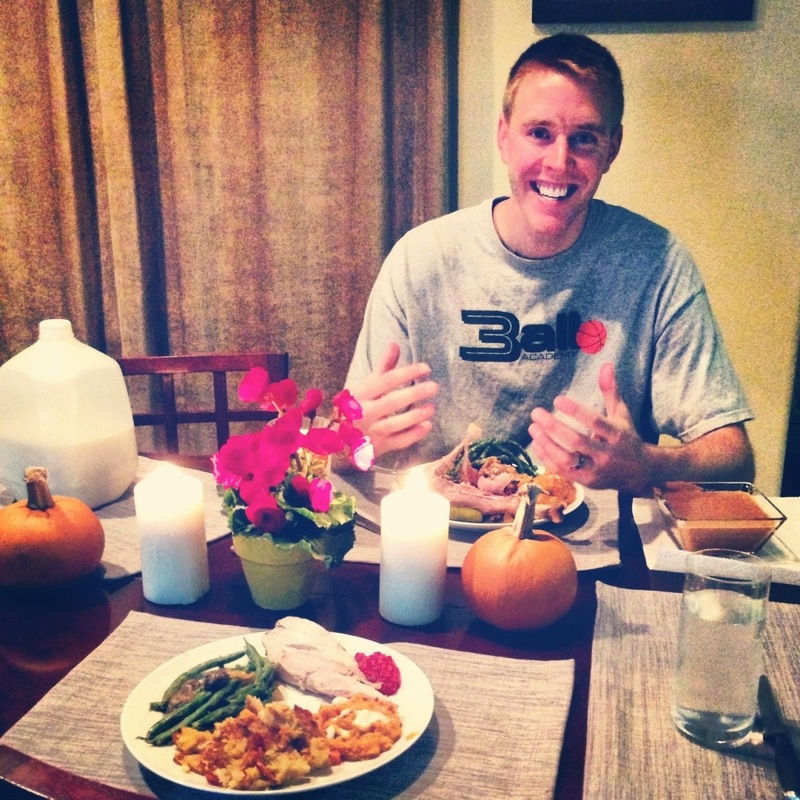 I do, however, have one main piece of advice for you when embarking on your first Thanksgiving meal. Do not – I repeat, DO NOT – slice your hand open the night before. Raw turkey juice is not pleasant to begin with, and it is even less so when it seeps into unnecessary wounds. I’m a proud mom and you are a terrific cook!